Amy and I went to the Music Education Expo at Olympia on 26th February 2016. As usual we spent the day wandering around the 50+ stands covering all things music and went to a couple of lectures, I particularly liked one lecture on encouraging positive behaviour during lessons. Coach House Pianos – a piano showroom in Wales. Family run, they have over 250 pianos for you to try. Sure, it’s in Swansea so a bit of a trek, but if you are serious about buying a piano but don’t know which one to buy, then this is the place for you. They have a selection of Steinway’s, Yamaha’s, Bechstein, Bosendorfer, Bluthner and Kawai’s. Let me know if you are interested in buying from them as I am always happy to come piano shopping with people. Carrying on with pianos, we found this great Yamaha piano. 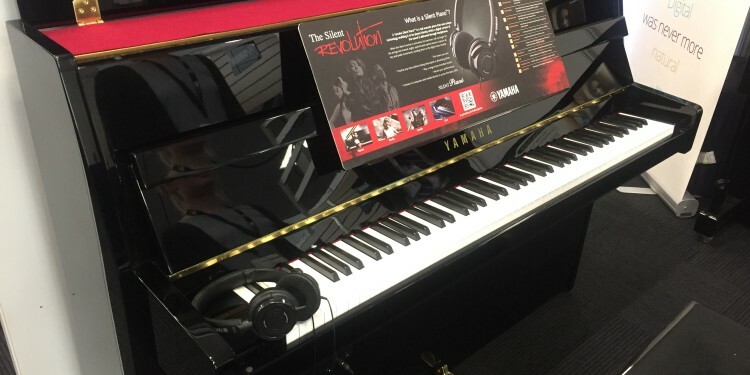 It can play like a normal piano AND completely silently with headphones due to a clever bit of technology inside. Starts from £3,500. We then also came across this company called Black Dress Code making black concert attire. Very useful for professional concerts. We stopped to have a chat with our friends from the BBC Ten Pieces team and I saw this flyer for BBC Proms Inspire – they are looking for composers between the ages of 12 – 18. For more, see bbc.co.uk/promsinspire for more details.